Pálava Hills: Where Are We? On the Czech/Austrian border, about an hour’s drive north from Vienna, and about 30 minutes south of the Czech city of Brno. A map of most of the Pálava Hills from Mikulov in the south to Pavlov in the northwest corner. The video, taken in late November 2015, highlights some of the major wine towns and vineyards of the Pálava Hills, starting from the view of Březí, the camera rotates north to find the limestone of the hills and finally looks east towards Mikulov. 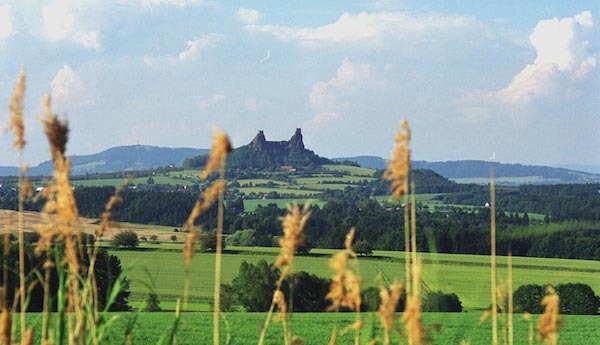 (Fun fact: Březí and an unseen town nearby, Dobré Pole, have names that mean “With Calf” and “Good Field” respectively, indicating what their purposes were in the past). The video both captures and obscures the Pálava Hills. It accurately displays their elevation, but not their stature: they only rise about 350m (approximately 1150 feet) from their lowest to their highest (Děvín). That’s not sooo much. But, the hills linked together, like a ship in port, loom well over the surrounding land, more than what can be expressed by the camera. As one can see, from the west (and the unseen northwest) the Pálava hills rise fairly steeply to their heights. Heading east from the crest, the land undulates down more gently through UNESCO-protected forest, a few grain fields and even fewer vineyards. Grapes, particularly in cool regions like Pálava, need southeast- to south-facing vineyards to increase exposure to sunlight and maximize metabolism. Despite their location on the western side of the Pálava range, most of the vineyards do have good southerly orientation. However, vineyards on the eastern slopes, some with excellent exposition, nevertheless can suffer from the higher elevation and gradual descent of the land. Too-cool temperatures in the spring and fall can retard their growth or even threaten with frost. How much difference can a few hundred feet make? Townspeople in Mikulov attached an old and impolite moniker to the inhabitants of Klentnice, the highest village in the area; they called them, “Snow-monkeys.” Cold can bruise egos as much as fruit. As one descends very intriguing sites do exist: On some sectors of U Božích muk, southeast of Pavlov, Dense limestone rests only 40-50cm below the surface, in one area even “blooming” to the clayey surface in chunks of dense white rock. With early morning sunshine, Sauvignon and Pinot Blanc express themselves quite well on this soil. Are the current locations of vineyards historic? Could people have previously planted more on the eastern side with it’s hypothetically-better exposition? Of the maps I’ve seen going back to 1867, the situation of the vines remains very similar to what one sees today, vines planted mostly on the western/ southwestern face, with a slightly smaller acreage on the eastern face, woods and game land farther east/ southeast from the crest. That’s hardly going back to the Romans, but I don’t read Latin yet. Czechs call the Pálava Hills the “Provence of the Czech Republic.” (That’s a little like a book title I once saw, “The Paris of Appalachia: Pittsburgh in the 21st-century.” I am a Pittsburgh fan, but yinz ain’t got no Louvre there. St. Thomas Aquinas didn’t teach there. One might say both cities have buildings and people and at least two french bakeries.) The region enjoys more sun and drier days than most of the Czech Republic, both aspects that make grapes happy. The bright white limestone of Provence finds its pretty little sibling in the cliffs of Pálava, but, please, it’s no Provence. Thank goodness. Upon What Do We Stand? You are standing on something pretty complex. Don’t worry! I’m not going to get that sciencetifical in the descriptions. To do so would test you, dear reader, and make me sound like a fool. I’ll keep it simpler: Sediment deposited by flooding and wind make up #9. When did those natural forces do that? When you weren’t looking. As a summary of the grape geology of the region: The blues on the map above correspond with the limestone or calcium-rich marlstone heights of the Pálava Hills. Soils made of these degraded stones appear below that, followed by sand, silt, and clay deposited by wind and rain. Moving towards the green areas located at the base, one can find sediment left from the ancient sea and more recent glacial eras, as well as sedimentary rock from those eras. The grapes grow on a mixture of limestone, loess, loam, clay, gravel, and sand soils – that’s the short answer. And one must find the optimal grape for a given soil. One grape grown on dry, limestone soils might have attractive aromatics and flavors, but that same grape on damp loess and loam might make a diffuse, bulky wine (I’m writing about you ryzlink rýnský!) That said, one might list the general characteristics that a given soil type contributes. Limestone: Limestone soils provide aromatic and gustatory complexity, elegance, and medium to medium-high structure to many wines. Generally, limestone in a vineyard is a positive, and many of the worlds great reds and whites have limestone to thank. Sand: Good drainage is healthy for most vines varieties, but sandy vineyards tend to make lighter, more delicate wines. Loess: A soft rock of very fine sediment deposited by wind and compressed, Loess often has a high amount of eroded, pulverized limestone in it. It tends to provide fullness and plenitude in a wine at best – a Veltlínské zelené (Grüner Veltliner) grape thrives on this soil and creates great wines for instance – but bulky, unfocused, dull wines at worst. Loam: Loam is great for growing grains and other plants but its higher organic content demands a correct vine. Vines generally produce better grapes (and therefore wine) when growing on poor soils; put an average vine in good soil and it concentrates on leaf growth instead of attractive fruit. Loam can easily create bland wines. Grapes that need higher nutrient content, like the Veltlínské zelené, might make more respectable wines. Clay: Generally speaking, clay doesn’t provide structure in wines, but some complexity and a lot of, sometimes almost surly, power. Drainage can be a problem with too much clay, as it doesn’t always pass on water easily. Gravel and Stones: What these two sediments will bring to a wine depend very much on their origin. Is the gravel broken down limestone? Are the stones in the vineyard quartz or basalt? In any case, they help provide good drainage in large enough quantities and can reflect heat and light onto the fruit, depending on characteristics. Generally gravel and stones are positives in a vineyard. Well over 50 titled vineyards exist in the Pálava Hills region, with names like, Kraví hora, Slunný vrch, or, U Boží muky. The names give clues to the characteristics of the vineyard, or at least former characteristics. In the past, one would expect to see cattle on Kraví hora (Cow Hill), and a crucifix or chapel at U Boží muky (At God’s Anguish). On a clear morning, we should still be able to ascertain whether Slunný vrch is a sunny height or not. While profiles will expand in number and detail with time, below are three quick ones to illustrate some of the top vineyards in the area, combined with any experience I’ve recorded tasting them. Glacially-rounded rocks in the soil there. Near the bottom left of the previous map rests the village, Březí. In the sea of green above it are two little islands of orange/red (Soil #23) – Ořechová Hora (Nut Hill). Ancient flooding of the Quartenary period (2.6 million years ago to the present) deposited a medley of loamy clay, rounded stones, and gravel to create this hillside now covered in vines. Descending through the vines, one observes easily how quickly the size and distribution of rounded gravel change. A fair dispersion of quail-egg-sized stones at the crown of the hill quickly turn into sparser pebbles about 30 meters away. The base of the hill holds few if any stones; and instead of light brown soil like at the top, one finds a deep dark loam. The wines that I’ve tried from this site, I like quite a bit. While not holding the complexity or intensity of some of the vineyards on the Pálava limestone proper, I find the Ořechová Hora wines to have a certain confidence and pleasantly round body. As a fairly rare geology for the area, it provides an interesting contrast to the wines made from more calcareous soils closer to the Pálava Hills. Ryzlink vlašský has some of its best expressions from this vineyard, probably the most revered in the Czech Republic. Lying below the cliffs of the Obora Hill, the vineyard benefits from a limestone base covered with a complex mix of gravel, loam, loess, clays, and sand. With a slope that creates natural drainage and with suitable exposition towards the sun, Železná pushes the best of the Hills into the Ryzlink vlašský grape, a variety quite married to this type of soil. That’s not to say that the wines from Železná are immediately approachable. They have so much material in them that they need a few years to harmonize the intense citrus and stone fruits, honey, and floral characteristics with a staunch and firm minerality. I like this vineyard. Years ago, it was one of the first names I could pronounce; it reminds me of Thor, and the wines are good. Ryzlink vlašský expresses itself well here. Lying below the Železná vineyard, it shares many of the same soil types: Loess, loam, clay, and a little less sand. Where it differs might be in sheer number and size of broken limestone gravel and rocks (It has less) and in the depth of the soils before the roots reach the bedrock. If weather patterns continue to heat up drastically as they are, vines in Goldhamer might find its deeper soils more advantageous than higher vineyards with drought-susceptible thinner top soil. We shall see (and taste). The Goldhamer wines hold just a little less steeliness and minerality than the Železná vineyards and are just a bit more round, but contain many of the same aromatic components, A common aromatic thread through the two vineyards for me has been a bracing pineapple/pineapple skin. Mikulov, the Pálava Hills Region, and Their Wines. Wine grapes from which wine is made. One could ask that about anything really. What makes wine different than “Hello Kitty” products or fine jewels or Oreos or beer or football or American football, or fashion? Any fanatic can certainly list their compelling reasons, a list that will ultimately confine the person to a small cadre of con-celebrants and concerned friends. But wine is different. Why? Because wine. Wine, like a picture, reflects its source and creator. A bulk wine, like Australia’s famous Yellow Tail, reflects as much about the goals of its producer as the painting, “Gazebo of Prayer” tells a person about the goals of artist Thomas Kinkade. Thomas Kinkade’s”Gazebo of Prayer”, second in popularity only to his ” Contemplative Garden-Yurt,” painting. Well, maybe Yellow Tail isn’t that bad. The Pálava Hills in Southern Moravia make these wines. What follows is a summary of this region and its main town Mikulov. A brief historical section will summarize 150,000,000 years and highlight some of the events that give context to the Pálava Hills wine. In interest of brevity, this introduction does not mention the vital Jewish history of Mikulov, nor its role in the Iron Curtain, nor its growing culinary and art scenes, nor much of its architecture, nor the Pálava Hills importance as an UNESCO-supported nature reserve. (If you are interested in visiting, though, contact the good people of Pathways). Afterwards one can read about a few of the different producers and their libations. As time goes by I will expand the information, but this initial posting should give you an inkling of an idea of a taste of this beautiful – wine – region. Continue on to: Pálava Hills: Where Are We? Working on a small writing project here in the Czech Republic, a little introduction to wine in this beautiful country. Nothing grandiose, but with a goal that it be helpful, interesting, and accessible. This post, though, has little to do with that subject. Doing research for the project this weekend, I stopped for Mass in a village this weekend. I am Catholic, which has a lot of definitions to different people. One might describe my faith as: Stumbling and tripping, hopefully towards God, even in the Communion line. The Catholic Church in the Czech Republic seems to be a relatively small, but healthy organism. Churches are by no means full, but the population consists of more than just canes and walkers. (And respect to those people on canes and walkers, many of them practiced their faith throughout the anti-religious Communist years). The liturgy came simply, without flourish, concordant enough with the liturgy’s setting, guided by a younger priest with two teenage boys as altar servers. I understood little, but at least I understood a little. The prayers of Consecration were quick, devout, and as people lined up for Communion, the choir struck a familiar “Chord, that David played and pleased the Lord.” Suddenly, from my already stilted attempts of distracted contemplation and devotion, I could only think of kitchen chairs and haircuts. It’s a tune I respect immensely; and by dint of its popularity, I distrust the “cult” around it. I do hope the lyrics were changed for the service. Some people might be aghast that such a tune ring out in a church. Well, it ain’t the first time. Lots of hallowed songs have rowdy, raucous, and romantic beginnings. The music of the respectable Star-Spangled Banner comes from a drinking song, and I think some of the old Welsh tunes were appropriated to create some of the greatest hymns of Protestant Christendom. Of course, some people might be aghast that such a tune ring out in a church. Because religion is stolid and dry and restrictive and heavy-handed and evil and it’s appropriating something real and sensual and codifying it. Religion also happens to supply much of the imagery in the lyrics of the aforementioned song. There is a sensuality in faith, hidden at times, seemingly dry at other times, and sometimes dry, that can spring forth healing clear and clean. What does the experience teach me? I don’t respond well to Leonard Cohen’s hit song in church. Also I can choose to be easily offended or easily amused. I’ll try the latter. Troja Chateau, Prague. It faces some of the vineyards of Prague. We might accuse Czechs of lacking an imagination: They don’t have to pretend at all. Seemingly, there’s a fort on every hillside; from one you can spy a castle; the castle is abandoned because its owners moved into a nearby palace. But of course, the Czechs have their fantasy world, except they can conjure up the battles, princesses, hearth-cooked feasts, and courtly intrigue while standing where such events really happened! If you are perusing this article, you’re probably not standing in a fortified Czech building (The thick wall aren’t good for Wi-Fi signals); hopefully the following words and pictures will give you a tiny idea of the country’s architectural riches. A fort (or fortification) is any military structure built for protection against attacks. Forts can be used as a base of warfare, or to “solidify rule” in times of peace (Wikipedia, 2015). Given the convoluted and sad history of the Terezín fortress, that definition doesn’t quite stick. A fortress that became a town that became a concentration camp that became a town… I find it one of the oddest places in the country. Covering nearly 4 square kilometers (2.49miles) of space, Terezín, or Theresienstadt as it was called at the time of construction in 1790, was designed for up to 11,000 soldiers during wartime (Wikipedie, 2015). Wartime for the fort’s purpose was Prussian aggression coming from the north and northwest. 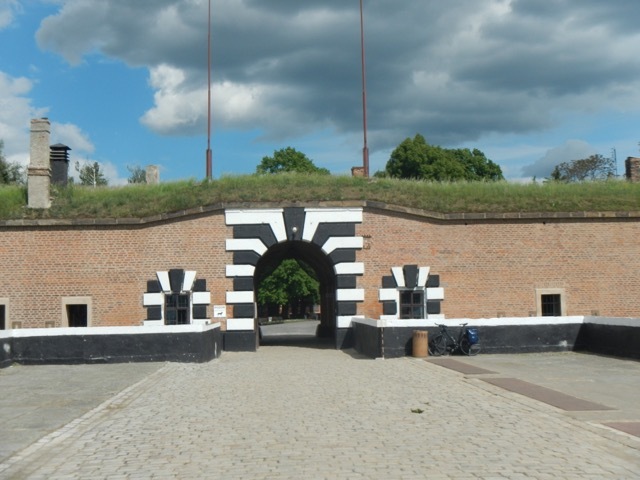 But those attacks never arrived: The Hlavní Pevnost (Main Fortress) garrison became a town witha a small barrack for soldiers by the mid-19th century while the attached Malé Pevnost (Little Fortress) remained a military base and prison. Visiting Terezín is nearly a “must-see” if one visits the Czech Republic. Not because of the impressive structures (Flood gates, brick tunnels, heavy walls and the like) or the gruesome details (One can watch a horror movie to be grossed out), but in remembrance to what people can do to each other. In this fortress one discovers not only the depths of human cruelty, but the strength of human charity. Ok. Trosky’s a ruin. I admit that. 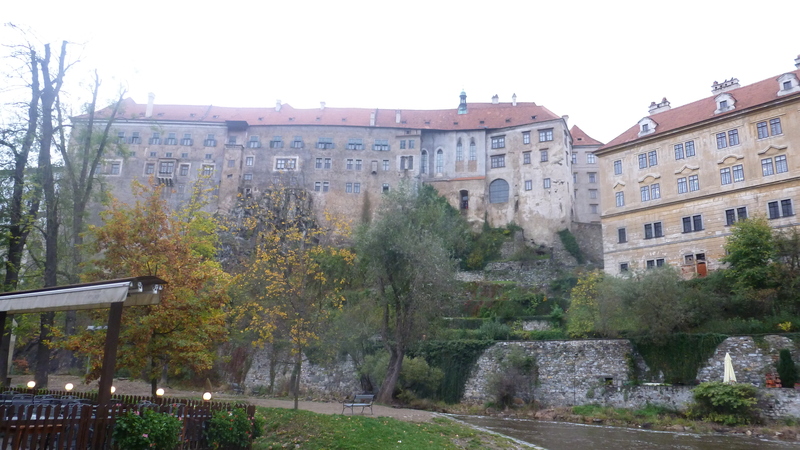 One could visit Karlštejn, or even just Hradčany in Prague to find immaculately restored structures oozing nobility. One will not be disappointed. But easily slipping out to a different realm, one can escape casual tourism and delve into Czech history and verdant nature at the same time. Trosky isn’t just a ruin. It’s a ruin of a castle, “A large strong building, built in the past by a ruler or important person to protect the people inside from attack,” according to the Cambridge Dictionary (Cambridge Dictionaries Online). Usually, if not always, these were the homes of the local nobility or leader, and became prevalent with the disintegration of the Carolingian Empire in the 9th and 10th centuries (Wikipedia, 2015). Indeed that was Trosky’s role, a defensible home that displayed its owner, Čeněk z Vartemberka’s, power. This narrow fortress stretches out between and upon two basalt columns, the remnants of prehistoric volcanic activity, elevated high above the surrounding sandstone hills. A system of cisterns and paths to underground pools supplying fresh water made this castle particularly defensible – in its long history, only time has successfully sieged Trosky’s walls. Not that Lord Čeněk got to enjoy that security. He most likely paced the keep’s floor, unable to enjoy the beautiful view as an aide announced his debts. Trosky was his ruination and z Vartemberka had to sell it and other properties to King Vaclav IV in 1394 (Historie Hradu Trosky, 2015). What a beautiful view he missed. People call the region Český Raj (Czech Paradise) for good reason. Rolling, wooded hills, pure water, and sandstone pillars make this a tranquil environment for locals and visitors alike. Some of Europe’s most dramatic rock climbing is located in the cool valleys of Český Raj, and stories of medieval brigands and vodníky ( supernatural watermen) abound. This world-famous palace might look like a castle, it has been a castle, but don’t be fooled! What’s the difference? A palace isn’t built for defense; it just announces the wealth and power of its inhabitant(s). 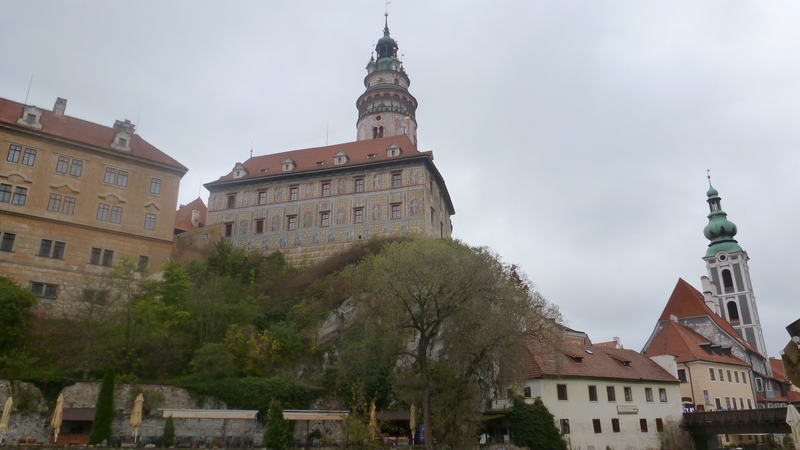 Český Krumlov certainly announces the glory of its best years under the Family Rožmberk. The lord of that golden age, Wilhelm von Rožmberk, was an intelligent man influenced by Italian culture; he spent no small sum remodeling his family seat in a more southerly style. His colorful Renaissance tower looks out over the eponymous town and the courtyards blend Christian and Classical thought. These embellishments imply a realization that stone walls would not hold long against the cannons of the 16th century. Wilhelm had turned the castle into a palace. Further stately ossification occurred almost a century later, when the following rulers, the Eggenbergs, turned the wooden drawbridge into a permanent, covered corridor connecting the castle to the hillside and the delightful Baroque gardens upon it. Elaborate gardens and ornate bridges are not marks of a structure focused on defense. Today, only tourists attack the castle, ogling the bears that have been a tradition since Wilhelm’s era. They hike up the tower (the tourists, not the bears); they take a one hour tour of the main rooms, they rarely explore the geometric hedges that slowly disorganize into a proper English garden. The castle deserves more time than just an hour, and the city more than just a half-day. If you’ve read this far – congratulations. Wipe the sweat from your brow, and be proud that you did more than I usually do – simply skim an article. I do hope that by taking some minutes of your day, you’ve been able to learn some fun facts about the history of the Czech Republic. And if you’re interested in visiting, don’t hesitate – there are plenty of wonderful surprises in store. The heat has broken, thank God, the brightness of summer turning to the milky white light of early fall. School has started, this ritual that thus far in my adult life I have observed from afar. My apartment faces bridges two worlds. Often, the morning traffic, starting about 5:30 is what wakes me. The first time. I am trying to rise at 6:30, at this point the cars and buses and trams create a din if my window is open. Often I can withstand the noise until 7:30, at which point I often rise. The view from my room, beyond the motorized vehicles, is gray and rectilinear from the panalak apartments similar to the one in which I live. A dull, supermarket building with a BRIGHT yellow name provides convenience if I need milk for coffee. Coffee leads to the other view. My broad kitchen windows open up onto the woods and the fantastic nature reserve 5 minutes from my back door. The view right now is mostly green, flush from current rains, though a premature hue of autumn has appeared from this summer’s drought. All the same, beautiful. And the sounds! Wind in the leaves, birdsong; as the day progresses the shrill, happy cries of children playing at school. So two sides, two views to see, a rich existence even before I leave the apartment. The heat has broken, which seemed to annoy many Czechs as much as I did. And so we will gain some normalcy, some patience. I think for a brief time. The press of Syrian and Afghani refugees in Hungary will eventually move this way. The Czech government hasn’t exactly been welcoming, and the Czech culture itself is cloistered (in a secular sense) by the ranges of low mountains that surround much of the country. What will be the response? It will be tough! There will be some good and some bad. It can be a chance for firsthand interactions with cultures often portrayed as violent and prepared for jihad. It will be a chance to welcome some new traditions. It will be an interaction with tired, frightened, and ambitious people. Czechs will meet many people who don’t drink beer! (That could be very profound!) It will be growing pains. And hopefully for the better. We shall see… but any weary traveler needs a glass of cool water and a welcome. And if they want a beer, I expect it will be given.